Life is full of things you can’t control. But there’s a lovely sense of peace that comes from having order in the space you can control – your home. Yet creating that order can seem impossible. With work, family, friends, and any kind of personal life (what’s that again? ), there’s not much time left for turning your home into an Architectural Digest spread. Clever habits for keeping your home organized. And because life is complicated enough, my strategies are simple. Whenever you buy a new pair of shoes, piece of clothing, book, gadget, toy, or whatever, get rid of an old one (I call this OCI-OGO – one comes in, one goes out). 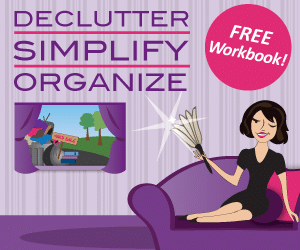 This strategy alone can put an end to clutter creep. Whatever task you’re doing – whether working at your computer, cooking dinner, playing a game with the kids, or watching TV – make cleaning up and putting everything away part of the activity. Factor this clean-up time into the time you allow for the task. This idea can change the way your home works. I’ve written a range of products and programs that offer hundreds of strategies like these. They’re designed to help you take action to declutter, simplify, organize, and create a happier home – quickly and simply.